I remember the first time my little girl, then probably three or four, came running to me in tears because another child in the park she was playing in, had been rude to her. She was clueless because she had never encountered anything like this. Running back to mommy was the only thing she knew. Of course, mommy had to oblige, wipe her tears and go pull up the bully. Right? At that moment it seemed a tangible solution and I actually went up and spoke to the child who was responsible for my girl’s tears. As I saw her bounce back again and monkey on the bars, I patted my back congratulating myself on averting the crisis. Tackled that one well ehh…. What I did that day was a very short-term solution for a long-term situation. On our way back home, I realised my mistake and berated myself for the knee jerk reaction I gave that day. Few days later, I do not recall what sparked the discussion, I sat her down to talk about it. Just a reminder of the episode was enough to fill those eyes with tears. I hugged her gently and told her that we cannot expect everyone to be nice with us. If someone isn’t, we may not have the luxury to run away every time. And mommy may not be able to rescue her every time. Her chin quivered, those tears threatening to come out as she looked at my face feeling like a lost child. I hugged her tightly, comforted her…those were the times a kiss and a hug were enough for my girl. It was a difficult concept to drive home. First, we tell the kids to be courteous and well behaved and then we throw them in the real world to deal with its harshness. But then that is the reality, we may like it or not, that’s how the world conducts its business. We can’t build a sanitised bubble for our kids where we have the luxury to choose what goes inside that bubble and what stays out. People will be mean. Don’t expect them to be soft, it’s our children who’ll need to be tougher. Let children go out and interact and develop their defense mechanisms. Of course, you need to hover around to step in if things get messy. 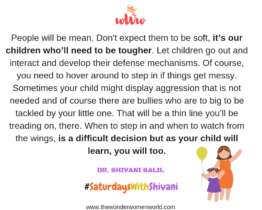 Sometimes your child might display aggression that is not needed and of course there are bullies who are too big to be tackled by your little one. That will be a thin line you’ll be treading on, there. When to step in and when to watch from the wings, is a difficult decision but as your child will learn, you will too. Starting early helps because the issues are smaller and they offer a controlled environment for both of you to work your way through. I have seen my girl fight back at times and withdraw at others. She gauges the situation, measures up what she’s up against and decides her reaction accordingly. 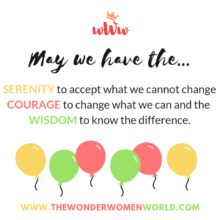 She surprises me often, when she just shrugs away some of the unpleasant stuff saying, ‘Amma, it ain’t worth it.’ And yet there have been times when she’s put her foot down with her really close friends, if she found something offensive. She risked losing them but stood her ground. More often than not I have seen them coming around and it has in fact earned her their respect. They became more mindful of her personality. This parenting experiment seems to be working well, atleast as of now. I’d say, leave them to their wits, they’ll find their mojo. They will make a place for themselves and will find like-minded people to surround themselves with. They would grow up being comfortable in their skin and would probably adjust better to the cruel world that awaits them. We learn it the hard way ,no doubt . Interactions start with the ‘gang age’ and are there throughout our life . Parents’skillful and wise handling in impressionistic years does miracles . Some children turn to be wise enough in their teens while some people are like grown-up babies in their seventies too. Crux ,as you said , lies in the fact that children are to be left to their own insight at the earliest .